Dai - Mike, I watched you playing for Neath when I was growing up and I knew you had played for Swansea but until I sat down with my mate Tudor last week, who is an All Whites guru, he told me you had a fair career with the Whites. Mike - Yes ! I wanted to play for Neath, having spent 3 years playing for Neath Colts but when I talked to Rees Stephens he said I was too small for first class. Dai - Even though you had represented Welsh Youth ? Mike - Yes ! so off I went to the Whites and played in 2 or 3 trials, I asked to join the team and they said, no problem, your in, at the time John Leuleu was coming to the end of his career at Swansea and moving on to Llanelli, John incidentally captained 3 first class clubs, London Welsh, Swansea & Llanelli. I spent the next 9 seasons at Swansea and still hold the record for the number of games played in a season (1964/5), never missed a game, 47 games + all the sevens tournaments. Dai - So what colour is your heart Mike ? Is it white (Swansea) or black (Neath) ? Mike - It's black Dai (sigh of relief from over the other side of the room), I grew up in Neath, my family are from Neath and I played for and coached Neath and I live in Neath. We exchanged family histories and it turns out that Mike lived about 25 metres away from my father & grandparents in Leonard Street, it's a small world. 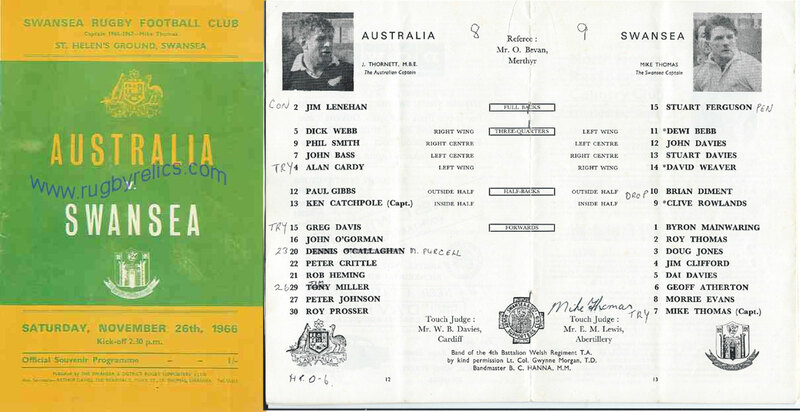 Dai (producing a Swansea v Australia 1966 programme) - you captained the Whites against Australia in 1966 and scored a try in the 9-8 victory, was it a fall over the line try or did you run the length of the field to touch down. Mike - Our tactics for the match were to kick the ball to Jim Lenehan's weaker side, Clive Rowlands was at scrum half and he was an astute tactician, but the try I scored because I pressurised the outside half, he dropped the ball, I picked it up and scored under the posts. I was targeted and raked badly in the match by the Aussie forwards. Dai - so how did you come to leave the Whites and play for Neath. Mike - Swansea selected their squad at the beginning of the 1969/70 season and put it up on the notice board in the clubhouse one night after training, both Geoff Atherton and myself sat back thinking it was a given that we would be on the list and let the newer players check it out, they came back to say that neither of us were on the list, when questioned, the selection committee had decided that the new policy was for bigger flankers. I played a few games for the (Swansea) Athletic but then Neath asked me to join them. 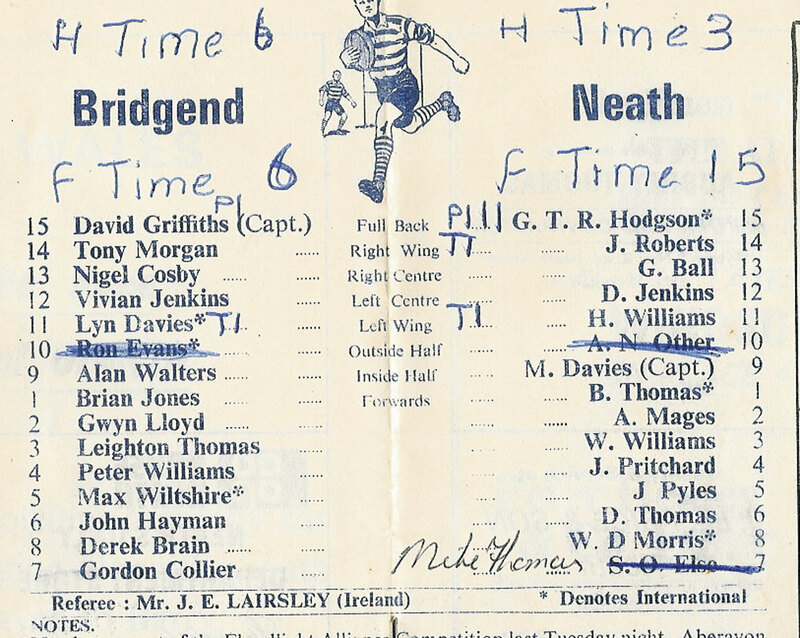 My first match as a Neath player was against Bridgend that season (8 Nov 1969) although I had played for Neath on permit from Swansea as far back as 1962 (1 Sep) against Maesteg. 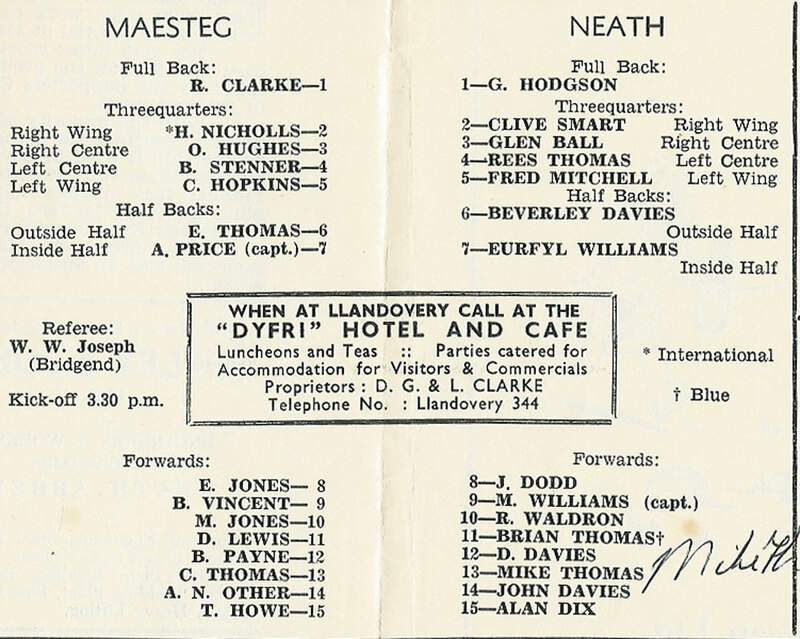 Dai - I had checked by email with Mike before arriving what he considered were his best performance as a Neath player and the best performance by a Neath team ? Mike - They were,the Cup Semi Final against Cardiff at Bridgend when we destroyed Gareth Edwards and Barry John, then the final against Llanelli when we destroyed their pack. Everyone thought that they were the finest games. "Before we went out for the team photograph in the semi-final at Bridgend Brian Thomas said 'nobody is to smile' and nobody argued with Brian. That set the mood, we had a job to do and we followed suit in the final, there's not a smile to seen amongst the players"
Dai - So tell me about the Cardiff match. Mike - "Without a shadow of doubt this was the finest game Neath ever played" - in my opinion of course. Dai - What made it so special ? Mike - As a back row Wilson (Lauder), Dai (Morris) and myself worked as a unit. I was openside and from scrums and line-outs Dai and Wilson would always tell me to make sure I covered the outside and if the fly half or other back who had the ball cut inside me then they'd nail them. In that game everything just clicked for the back row, the pack and the team as a whole. Then in the final it was more or less the same, we steamrollered the Scarlets pack and the rest is history. It was around this time that Barry John announced his retirement. It would be interesting to know the exact date in relation to this match (12 April 1972) was it before or after and did this match influence his decision ? Dai - Is there one particular incident in these matches that stands out ? Mike - To be honest with you Dai I can't remember anything from the semi-final, it was all a blurr, I can't even remember who scored (Dai Parker - drop goal, Martyn Davies - try & John Poole try, conversion & penalty) and as for the final nothing stands out. 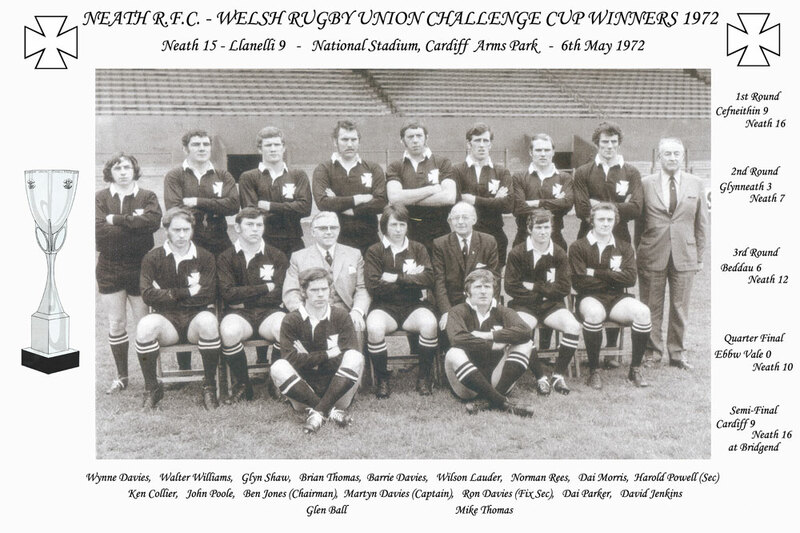 The one thing I do remember though after the final when we got back to Neath we were celebrating in the clubhouse and someone had the idea to take the cup to the 'Workies'. 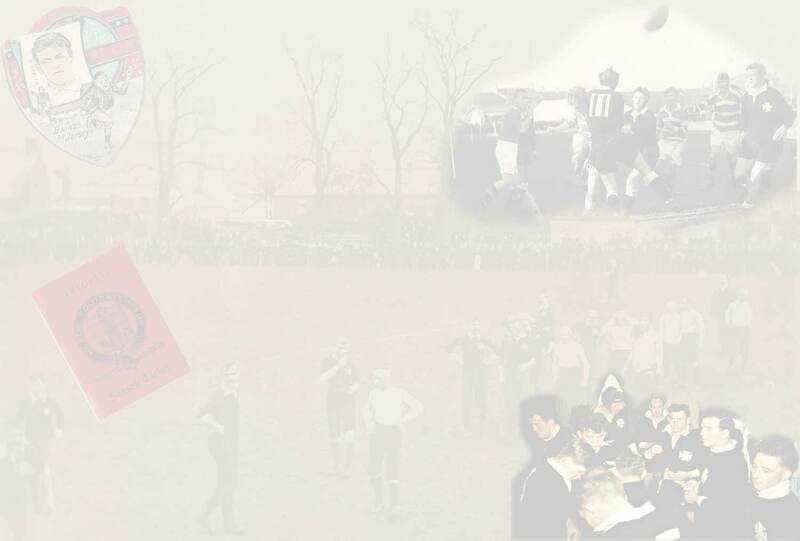 There were lots of members of the Neath Workingman's Club who were dedicated Neath supporters and the club had run 6 supporters coaches to the game. So we grabbed the cup and run down to the workies with it. When we got there, there was an old chap on the door with a cloth cap on and a membership book. He wanted to see our membership cards before letting us in ? We explained 'we are not members, we are Neath and we want to show the cup to the supporters who were at the game' and he still wouldn't let us in. Eventually someone inside realised what was happening and a committee member over-ruled the doorman. That was a great night. 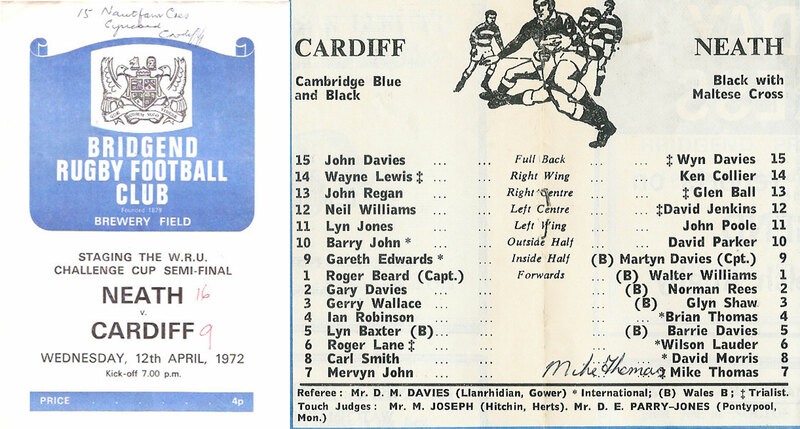 Dai (with my amateur sport's psychologists head on) - Mike seemed to think that the reason he couldn't remember much about the Cardiff game was down to age but I beg to differ. My belief is that Mike and the team were 'in the zone' their focus was on winning the match and nothing else. They were a collective unit and it wasn't individual's scoring tries and points, just the team. Consequently it is only the collective performance that Mike can remember. Dai - so your job as an open side flanker was to make life hell for the opposing fly half, who was the best you've played against ? Mike - Most people would think that the answer to this would be Dai Watkins, Barry John or Phil Bennett but I always knew what they were going to do so I could plan my attack in advance, the most difficult guy I played against was Keith Evans the Neath No 10, I never knew what he was going to do next, when I thought he'd kick, he'd run and vice versa. Dai - Thanks Mike it's been an honour to spend time with a Neath (& Swansea) legend. Click on the link below for Mike's profile on the Swansea RFC website. Glamorgan & Monmouthshire v Fiji 1964.